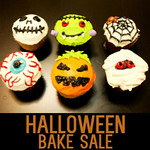 Our Annual Halloween Bakesale was held on Thursday 25th October. The 6th class girls had the huge task of preparing for this big event, decorating the classroom and baking lots of lovely treats. Each of the classes visited the bakesale during the day to buy some delicious goodies. All funds raised will be donated to LauraLynn Children's Hospice. Thank you to all who supported this worthy cause and well done to Ms.Kenny, Ms. Nagle and the two 6th classes for organising such a successful fundraising event!